So, it’s been quite a long time since I posted a blog here. As many of you know, I had a baby. I bought a house. I (re)started graduate school. And with all that going on, it’s been a struggle to keep up with the usual stuff–work, family, my own self-care, and the many other things that are important to me. I would love to promise that I’ll post an update soon, but it’s not realistic for me right now. So, I’ve got a few awesome guest bloggers lined up. I can’t wait to share what they have to say, as these ladies are truly amazing. Have you ever heard the saying “What you resist will persist”? How about Newton’s 3rd Law of Motion: “Every action has an equal and opposite reaction”? When it comes to eating disorders, trauma, and some other mental health conditions, I believe both of these to be true about a little something called “triggers.” Allow me to explain. People with eating disorders often talk about trigger foods, triggering events, and triggering people. 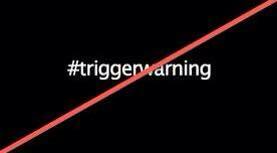 Labeling things as “triggering” like this gives these things far too much power over us! These things we call “triggering” set us off only because of the thoughts we have related to them. That’s right. It’s our own mind allowing these things to be problems for us! The more we avoid these things, the more we are potentially perpetuating the issue. I’m not saying, for example, that a person with the fear of snakes should be thrown into a pit of rattlers in order to get over their phobia, but perhaps visit a zoo or a friend who owns a snake. Do some research about snakes. Get to know them, slowly. Each time the snake-phobic person confronts the fear, it will have that much less power over them. Each time a fear is confronted, it’s an opportunity to understand the thoughts behind the fear and implement a healthy coping mechanism when necessary. Raw “triggering” moments can be the perfect time to tune into your thoughts and feelings and intervene with a healthy coping mechanism (or two). When you are feeling particularly “triggered” by something, take a timeout and scan your body and mind: Notice your thoughts. Are you thinking about what *could* happen, rather than what is happening or what you need in this moment? Notice the feelings that proceed the thoughts. Do you have any sensations in your body? How strong are they? What is it about this “trigger” that has such a high charge? One of my favorite tools is Emotional Freedom Techniques (EFT, Acupoint Meridian Tapping, Emotional Acupressure, etc.). EFT is an excellent mind-body connection technique that combines acupressure stimulation and psychological stimulation simultaneously. It’s one of my favorite tools to reduce chronic fear and anxiety in addition to dealing with them in the moment. There are so many ways to soothe ourselves. Explore and experiment. Find what works for you. Because anything in the entire world is a potential “trigger,” taking away the power that people, places and things have over you is a great place to start. We can’t avoid the world. There are so many truly wonderful and beautiful things we would miss out on if we did. Use “triggers” to get to know yourself and your needs, and start to trigger some happiness! Hi there. This blog is kind of a continuation of my post from last November, where I discussed my struggles and insights about recovery and pregnancy. I want to apologize, first of all, for going quiet on the blog. I do miss blogging, but life has just been … well, crazy, as I said. At this point, I’m 36 weeks pregnant (with all the discomforts that come along with that) and only 5 days away from moving into my first home. Yep, my husband and I bought a house! It’s pretty exciting, but it’s also been quite stressful … particularly with the pregnancy making just about everything more difficult. It is really quite terrifying to consider how I’ll handle all these changes (did I mention I’ll also be re-starting graduate school in the fall while still working full time and raising a little baby?). But I’m trying to think of it as exciting, and I’m trying to be grateful to have these wonderful things, people, and opportunities in my life. When things get tough, gratitude can go a long way in helping us to stop and appreciate rather than sink into a pit of despair or anxiety! I do have one recovery-related experience to share with you. Last night, while I was packing up my bedroom, I had to sort through a closet full of clothes, including some that are way, way, way too small. (I probably should have put them away a long time ago, but they were hidden in the back, so I had mostly forgotten about them). Many of those teeny tiny clothes I might never fit again, and sometimes that’s hard to accept, even though I’m generally happier and healthier where I am now. The experience was both emotionally and physically draining (when you’re 36 weeks pregnant, everything is physically draining). Thanks for reading, as always. And I’d love to hear how you’re doing!! This is the fourth post in a series where I discuss my top tips for quitting binging. These tips – or practices – have worked for me and many others in long-term recovery. In the first three tips, I talked about how important it is to eliminate food-related guilt (click here to read the first tip), to put weight loss on the backburner (click here), and to eat with mindfulness (click here). This fourth tip discusses the essential question of figuring out why you binge. So, why do you binge? How can you find out? The answer is different for everyone, and it may be fairly simple or fairly complicated. Or maybe you (like me) will discover that the reasons are actually much more complicated than you thought. But one thing’s for sure – if you can’t identify the reasons for binging, then long-term recovery will not be possible. I have two main suggestions for exploring these reasons. The first is to seek professional help from a therapist or counselor who can help you explore the emotional and cognitive issues underlying the binge urges. The second is to keep a diary of your feelings and thoughts before, during, and after eating. Ideally, these two practices work well together, but if you can’t afford professional help right now, the diary strategy can also provide a lot of insight! In the diary, I recommend including your thoughts and feelings (see this post to learn about the important difference between thoughts and feelings) as well as any situational issues (for example, your child had a tantrum). If you can write in the diary before, during, and after a binge, that is great! But it’s perfectly fine to just write in the diary after the binge has already happened. Even if you can’t make yourself write in the diary before a binge, it does help to just give yourself a little bit of space to think about why you want to binge, before you actually do it. Now, let’s talk about the different reasons for binging. Oftentimes the reasons are emotional, even if you can’t immediately identify an emotional cause. Using the diary and practicing identifying feelings in everyday life can help you begin to get an idea of what triggers your binges – including feelings such as boredom, loneliness, anger, sadness or even happiness; situational issues such as family problems; or destructive thought patterns. Some people use binging to fill a void in their lives, and it’s worth exploring what that void is really about. Some issues might not be obvious in everyday life, because they are much more deeply embedded into your thought patterns and experience as an individual. One very common underlying cause is related to the diet mentality that most of us have adopted throughout our lives; indeed, it’s so ingrained in us that we may not even realize it’s a problem at first … in fact, many of us have mistakenly believed that dieting is the solution to our problem, not realizing that it’s actually the cause. But the diet mentality and the obsession with weight, far from helping us, actually causes binging in most cases! You don’t have to be actively dieting to be greatly influenced by diet mentality … many of us don’t actually go on diets, but we are still very affected by diet mentality. If you ARE depriving your body through dieting (not eating enough), your binging could be biological – our bodies have strong survival instincts that tell us to eat A LOT if food seems scarce – this crucial biological instinct is meant to keep us from starving (even if we are, in reality, far from actually starving). In addition to eating in response to emotional triggers such as boredom or depression, my binging was greatly driven by the need to escape from perfectionism and diet mentality … it was all about wanting the forbidden, letting loose, breaking the diet rules, FEELING FREE! Oftentimes, I didn’t even have anything specific in my mind; I just wanted takeout because I had considered it “bad” or off limits. Toward the end of my binging days, I would tell my husband to go get “takeout” but then I couldn’t think of a single thing that sounded good! How messed up is that – clearly, it wasn’t about the food, but it was more about the IDEA of it – and what I expected it to do for me. Other more deep-seated underlying issues relate to past traumas (often from childhood, but not always) and other mental health issues such as anxiety, depression, bipolar and others. In those cases, it is often crucial to seek help from a counselor or therapist, especially in cases of severe traumas. But if professional help simply isn’t an option, you may find help in a support group, whether online or face to face, or in self-help books and other resources. You might notice that I didn’t list “trigger foods” as a cause of binging. That’s because I don’t believe foods are actually the triggers. I think that the reasons for binging always run much deeper than the food. Even when it appears that only certain foods are involved in binging, it is likely that the years or decades of diet mentality have given those certain foods an emotional charge or forbidden appeal. The process of intuitive eating is extremely helpful in overcoming the diet mentality and issues surrounding particular foods! Sometimes you can’t identify a precise cause, even if you’ve been practicing identifying emotions consistently. That is OK! And sometimes the cause might be that you were enjoying the experience or the taste – perhaps the binge was motivated by the desire to seek positive emotion (e.g., happiness, enjoyment, pleasure) from the experience rather than to avoid a negative emotion. Or it could be motivated by the desire to avoid the unpleasant negative emotion that arises when you try to stop eating, an experience that is pleasurable! That can be a really subtle feeling. Or perhaps it was motivated by restriction or rebellion – sometimes trying NOT to binge can be a binge trigger in itself! I think it’s useful to pinpoint the causes of binges but only to a certain extent … sometimes we go overboard trying to analyze things that it’s actually counterproductive! In other words, it’s definitely a great step in recovery to learn to identify binge triggers, as long as you don’t drive yourself crazy doing so. Ultimately, binging is an attempt to meet a need. To stop binging, we must identify what that need is and how we can address it in a healthier way (sounds like a future blog post!). Once you’ve identified those needs and underlying causes, you’ll be in a better position to explore other healthier coping methods, and avoiding binging will no longer feel like an agonizing battle of willpower, making recovery MUCH easier to maintain in the long term. What needs are you attempting to meet in your disordered eating behaviors? How did you find the causes behind your binging, or how do you plan to start doing so? I’ve been seeing a lot of numbers lately. Numbers of days binge free, numbers of days trigger food free, numbers on a scale, numbers of calories consumed. Don’t get me wrong—I love numbers just as much as the next person. They can be very useful and informative in the right context. I’m just not sure what these numbers are telling you when it comes to caring for yourself or whether they are useful at all for recovery. The numbers come from the diet mindset. We are so programmed to count—everything! These numbers seem to be a trap of sorts. After a number of days of being binge free, once you “fall,” the counting is halted—as is your confidence in yourself and your belief that you can recover. “Oh well, now I have to start over. Day 1 all over again.” That is the same as Day 1 of dieting. Again and again and again. But it’s not so! You aren’t starting over! Those days, the days you met your needs, cared for yourself, and felt good about yourself, are not lost! Nothing happened to those days. That experience of self-care is now firmly under your belt and is worthy of celebration! This is about a journey. One with peaks and many, many bumps along the road. Every time you use those new muscles to get to the other side of the bump, you’ve gained. You’ve gained wisdom, gained confidence, gained strength. It takes a tremendous amount of strength to get over those bumps. That effort shouldn’t be discounted with something as arbitrary as a number. Numbers can’t tell you how strong, amazing, deserving, or worthy you are. So please, put the numbers back where they belong—in a math book! Until recently. I am now pregnant with my first child. And it has completely turned my eating and exercise habits upside down. Add to this a new, stressful job and making plans to start graduate school, and the result is a lot of craziness! Pregnancy and morning sickness have really changed my eating habits in ways that I don’t really love—nothing sounds appealing, so I get little pleasure from eating these days, and I need to eat almost constantly to keep the sickness at bay, so I’m rarely hungry for actual meals. And I’m eating a lot less produce, and my exercise habits and social life have dwindled to almost nothing, thanks to near-constant nausea. It bums me out, honestly! But I just keep reminding myself that my body is going through some crazy things right now—producing a human being! !—and I need to be patient and just listen to my body as best I can. It’s a gentle reminder to me to listen to my body’s needs, not what my mind THINKS I should need. I think this is a lesson that can be applied to all of us: our bodies know best. Learning to quiet my mind and its incessant judgments about food and exercise (and everything else!!) was KEY to starting recovery, and I have to remember that it’s also key to continuing on my recovery path. And it’s a great reminder that circumstances change, and our bodies change for various reasons. I can’t control what my body is doing during pregnancy, and that’s such a frustrating thing to me … but I also think it’s a GREAT way of learning a very important lesson in letting go of that obsessive need for control. It’s Weight Stigma Awareness Week! Weight stigma and its close cousin, body shaming, both contribute to poor health. In fact, much of the health risk associated with obesity is a result of that stigma, which causes stress and anxiety, raising cortisol levels and thus worsening one’s health condition. Furthermore, body shaming makes people even MORE likely to binge, purge, or starve themselves. Anyone who thinks that making negative comments and assumptions about an overweight person is actually “helping” them, out of “concern for their health,” should think again – this actually makes things worse, not better. And this is even more true for those of us who shame ourselves – we can’t hate ourselves into better health. Only love can do that. Translation: When an overweight person is made to feel BAD about their weight and themselves, this has negative effects on health. Some doctors don’t yet realize this – and they make the problem worse by engaging in fat shaming! But there is new SCIENCE to back this up. Click here for a summary of recent studies. We all fall prey to believing weight bias and stigmas sometimes; it’s hard not to, in our society. Can you identify some ways in which you can try to reverse these harmful beliefs and judgments? So, what IS healthy eating? This phrase is thrown around a lot, and its meaning is vague at best! Here’s what I’ve learned during my eating disorder recovery. Healthy eating isn’t just about what you put in your mouth. Healthy eating also requires a good attitude and satisfaction with food and eating. Don’t believe me? Studies show that attitude and satisfaction from eating actually have a very significant effect on your metabolism and digestion – possibly even more important than what you’re eating! So, eating nutritious foods isn’t enough. Eating nutritious food is not healthy eating if you’re forcing yourself to eat foods you don’t like … or if you’re feeling guilty or anxious during or after a meal. Just as good health requires both good physical health and good mental health, healthy eating also has both physical and mental components. Our bodies and our minds are intricately connected, so when our bodies and minds are not in harmony, we are essentially at war with ourselves – and you can imagine what kind of damage can result from constantly being at war! So, what does this have to do with eating disorders? It matters because most ED people don’t consider the last part of the equation. They think that eating salads every day = health … or eating raw vegan = health. That might be true if a person genuinely loves eating salads every day or eating raw vegan AND if that way of eating creates no difficulty or anxieties (and no restricting or binging behavior). But most people who strive to “eat healthy” focus solely on what they’re eating without considering how it makes them feel. This creates a disconnect between our minds and bodies – or even within our minds. It is possible to derive both nutrition and pleasure from our eating. This is truly healthy eating! This disconnect is the problem with eating disorders. An eating disorder essentially means that a person has an unhealthy relationship with food and with her body. How do we fix that? For one thing, we can work on the right side of the equation above (the “attitude” part); in fact, fixing that part of the equation will go a long way towards fixing the actual eating part too. Don’t believe it? Try it and find out. Work on changing your attitude toward food. Experiment with different foods and eating situations, and find what gives you pleasure. When we change our thoughts, we change our reality. Do you have a healthy relationship with food? What does that equation mean for you? * I use the word “treats” here loosely to refer to “play food” or food that is eaten purely for pleasure rather than nutrition; however, the actual practice of intuitive eating involves giving up labeling food as “good” and “bad,” so in reality, any and all foods could be considered treats if you enjoy them!